After helpful feedback from organisers, we have compiled the following FAQ guide for people new to the festival, or just wanting a refresher on the key elements. If you don't find the answer to your question here, or would like more information, then please do contact Ray or Charlotte at the Lincolnshire Heritage Open Days Team via hod@heritagelincolnshire.org or on 01529 461 499. Lincolnshire Heritage Open Days is part of the National and European Heritage Open Days initiative that takes place each September. In Lincolnshire (including North and North East Lincolnshire), the programme of events is co-ordinated by Heritage Lincolnshire and is celebrating its 25th anniversary this year. In 2018 there were over 186 events and more than 31,000 visitors took part, thanks to the help of hundreds of staff and volunteer event organisers. 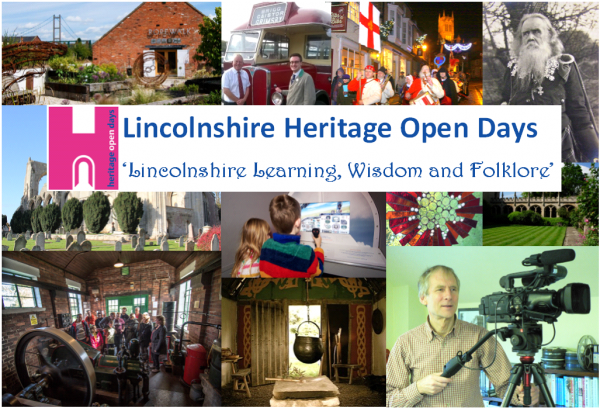 Our programme of events is developed by the Lincolnshire Heritage Open Days Steering Group, which is made up of volunteers from local interest groups and tourism and heritage staff from Lincolnshire’s local authorities. A different theme is chosen each year to bring variety to the programme. Although we hope that you might consider featuring an element of the theme in your event, please note that events do not have to relate to the theme so if you are struggling to find a connection, then don’t worry. As long as it meets the festival criteria outlined below, then you can register your event with us. Events must be free of charge and take place during between 13th September and 22nd September. Events and activities should celebrate the heritage, history or archaeology of Lincolnshire and where possible, highlight this year’s theme. Events and activities can be on one or more of the ten days, and at times to suit the organisers. Add-on features such as tower tours or children’s trails. Please note that this cannot be the focus of the event. For instance, if you are running an event at a church which is open year-round and are only putting on tower tours for the festival, you cannot charge for these, as they would be the only element that meets the festival criteria. You may also ask for donations, or raise money for your site through fundraising activities such as raffles etc. You do need public liability insurance to run an event. If you already have public liability insurance through your organisation, then this is sufficient. However, you must provide the company name, address and policy number in the space provided on the event registration form. If you do not have public liability insurance then you can still get free public liability insurance through the National Trust who organise the national festival. They provide free public liability insurance cover for all organisers, properties and events that comply with their insurance terms and conditions. The main condition is that you undertake a ‘risk assessment’ prior to the event taking place which you keep. Risk assessment forms and further details will be provided by us. Unfortunately the free public liability insurance does not cover weapons, musical instruments, transport, and other hazardous hands-on activities. Distribute brochures to hubs across the county for collection by event organisers. Posts you an organiser pack including a copy of the brochure, directional signs, poster template, press release template, and risk assessment template if required. Make available bunting, balloons and stickers when provided by the National organisers. Promote the festival with posters, in newspapers, magazines, radio stations and on social media. To help support you in organising your event, we do offer additional paid services for the small fee of £25. This is non-obligatory, but is great for organisers who have a busy schedule. Deliver as many festival brochures as your require right to your door. Please indicate on your Event Registration Form if you would like any of these extra services and include a cheque (payable to Heritage Lincolnshire) or a purchase order for the sum of £25. To take part in Lincolnshire Heritage Open Days please complete and return the Event Registration Form by email or post. If possible, please could you also include several photos that you give us permission to use in the brochure and online to help promote your event. If you would like your event to be included in the festival brochure, the final deadline for returning this form is the 28th February 2019. Events submitted after this date will be included on the festival websites but will not benefit from the extra publicity of appearing in the brochure. No events can be submitted to either the National nor Heritage Lincolnshire’s website after the 1st August 2019. Why is the Deadline for Registration so Early? The brochure is launched and distributed at the Lincolnshire Show in June and the Heckington Show in July, to attract the most publicity and give the public plenty of time to plan their festival. To have 25,000 copies ready for this, we must send the final version to the printers at the beginning of May. The festival is doing fantastically and growing year on year as the number of days increases. This however takes a huge amount of organisation and processing work at Heritage Lincolnshire, as we need to check, edit, agree, organise and design every entry that we receive. For 2019 we are expecting more than 200 events to be registered with us. The earlier we receive your registration, the more time we have to work with you on the editing to make sure your event entry is the best it can possibly be.